There is no one perfect approach to delegate tasks. However, there are some steps in the delegation process that need to be clearly identified and clearly followed for you to be successful in delegation. Last week in conversation with Alyson Van Hooser, I covered Delegating Effectively: What & When. Today we are looking into the delegation conversation. Follow these six steps to to ensure you handle the conversation to delegate tasks successfully. 2. Clearly say what you hope the goal or end result will look like. Hear that very carefully. We don’t want to tell them how to do the job, because then that’s just micromanagement–not delegating tasks–but we do want them to know what the end result will look like. Do you want it to be quicker, faster, cheaper, safer, higher quality, etc.? Let them understand that this is what we’re working toward. I think it was Stephen Covey, in his book The 7 Habits of Highly Effective People, who said, “Begin with the end in mind.” Well, your people won’t know what the end should be unless someone shares that with them. 3. Tell people what the limitations of time, money, and resources are. Right up front, say, “Okay, here’s your task, here’s what we want the end result to look like, and you are limited by ________.” You may say something like, “You need to have that done within the next two weeks, or you need to have that done within a budget of $500 or $5,000 or $500,000.” Whatever the limitations are, let them know upfront. 4. Ask for a restatement of what they’ve just now heard. In the conversation to delegate tasks, there is a lot of information put out there all at once. It is the responsibility of the person doing the delegating to ensure the message is heard and received correctly. If anybody messes that up, it’s the one doing the delegating, not the one receiving the delegation. As you are talking, he/she may start thinking, “Oh, man. I’m still thinking about number one and he’s on number three. I don’t even know what he said about number two.” That’s a bad thing because the employee, the person you’re delegating to, is excited about the process and their mind is whirling, but you’re already to step two, step three, step four and they may have missed important information along the way. What they repeat back to you may be incorrect. Verbally take responsibility for not communicating clearly and then move forward with the correct information. 5. Ask for their ideas. “[Employee Name], if you don’t mind, what are some of your initial ideas or your initial plans for this particular project?” Now, frankly, don’t expect too much because you’ve just now delegated the project to them, but, even in the early stage of delegation, one’s mind is going to start whirling. I want to at least have an idea of what they are thinking. The point being, leaders should want their employees to feel free in sharing ideas and thoughts without hindering or hampering that flow. The delegation conversation can be a great place for that. Allow them to respond and, if necessary, negotiate the timeline as needed. Include a midway follow up meeting where the agenda will be to discuss the progress of the project as well. This will ensure that no one is waiting until the last minute to start the task. 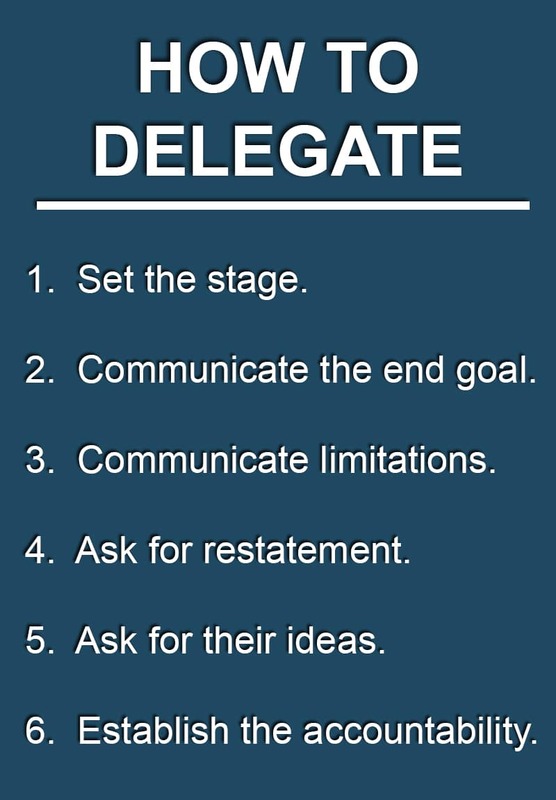 Use these 6 steps when you delegate your next task and watch the process become a truly become a collaborative effort!